So, how could I do a pie week without including a decadent chocolate something from Hershey? Clearly, this recipe fits the bill. If you ever need a chocolate fix, I think this should be your 'go to' dessert! Don't forget the chocolate sauce. That's what puts it over the top!! 1. Heat oven to 350°F. Grease 9-inch pie plate. 2. Combine sugar, butter and water in medium saucepan. Cook over medium heat, stirring occasionally, just until mixture boils. Remove from heat. Immediately add chocolate chips; stir until melted. Add eggs; beat with spoon until well blended. 3. Stir together flour, baking soda and salt; add to chocolate mixture, stirring until well blended. Stir in vanilla and nuts, if desired; pour into prepared pie plate. 4. Bake 25 to 30 minutes or until almost set. (Pie will not test done in center.) Cool. Prepare FUDGE SAUCE, if desired. 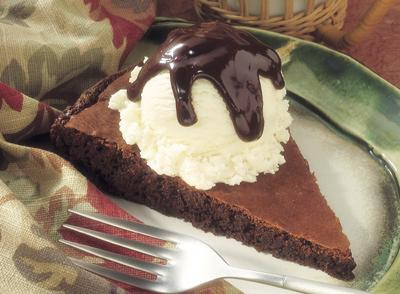 Top pie with scoops of ice cream and prepared sauce. 8 to 10 servings. Combine all ingredients in medium microwave-safe bowl. Microwave at MEDIUM (50%) 1 to 1-1/2 minutes or until hot. Using whisk, beat until chips are melted and mixture is smooth. About 1-1/2 cups sauce. CONVENTIONAL METHOD: Combine all ingredients in small saucepan. Cook over low heat, stirring constantly, until chips are melted and mixture is smooth.